When my husband and I came across Tim’s website we were both immediately impressed with the artwork and various designs illustrated, and decided one of his house signs would look great on the front of our house. Tim fitted the sign himself as we live locally and now that it is fitted, we are truly delighted with it. The quality of the materials used and the understated elegance of the design makes it look simply stunning. Thanks Tim. We are delighted with our illuminated number sign the quality is excellent it looks great with the light passing through the deeply etched numbers definitely worth the extra money. I bought a house number sign as a gift for my father. I was genuinely stunned by the looks and quality of the product when it arrived, truly superb. All the details that go to making a high quality product have been considered, like all stainless steel fittings and fixing screws. Tim is a pleasure to deal with. The plaque was delivered earlier than I thought – so that was a result for me. The workmanship is just fantastic and would recommend that very house in the UK has one – made by Tim. The plaque arrived yesterday as promised. It’s beautiful thank you very much and I’m sure they will love it when I give it to them on Christmas morning. I’m sitting here looking at my exquisite house number plaque. It is absolutely and utterly stunning. Tim, I really can’t thank you enough. Being an artist myself, I’d like to think I have an eye for the finer things, and it was obvious to me looking through your website, I was in the company of a like minded soul who prided himself in his work. Therefore it came as no surprise when I opened up the parcel to see, and hold, a piece of true craftsmanship. Tim, it is incredibly wonderful. Thanks again so much. We were delighted to receive our bespoke house number plaque. We looked at many different options and none of them matched up to the design that Tim produced for us. The quality and craftsmanship are clear to see and we would certainly recommend. Received my house number plaque yesterday – absolutely thrilled. Looks so stylish and is beautifully made – can’t wait to put it up. Many thanks Tim. Our glass house number signs create a stylish welcome to your home or property. Engraved and sandblasted, our house number signs are hand-crafted to the highest quality using 15mm thick glass, slate and stainless steel fixtures. Our small glass house numbers are available in a wide choice of fonts to create modern or decorative house numbers for your house or property. You can view a printable PDF layout showing the style of a wide choice of fonts here. There is also an image of the font choices opposite. Please place your order by selecting the font choice for your house number sign above, along with the number of digits and number required for the house sign. 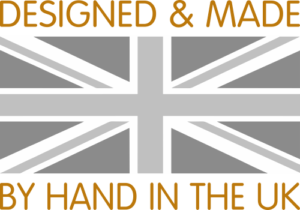 Once we receive your order we will email a design confirmation for you to view and approve or request any changes or amendments prior to manufacture. Please select your ‘Font Choice’ & ‘Number of Digits’ from the drop-down menus above and enter the number for the house plaque in the ‘House Number’ box. If you are unsure of which font to choose for your number then please place your order by selecting the Request Mock-up Design option from the ‘Font Choice’ drop-down menu and we will email you some designs. Digits can be numbers or numbers & letters.